The Church of England published its report, Talking Jesus, last week. It finds that, rather than interesting others in Jesus, Christians only put them off when they talk about him. What a dilemma! To evangelise or not when all it achieves is the opposite of what’s intended. Christians must feel their hands are tied. Not that this will stop them doing it, more’s the pity. But why? What drives some Christians to talk about their beliefs at every opportunity? What makes them think others haven’t heard of Jesus already? Do they honestly think that in England and other places where the Anglican church holds sway, people have never heard of him? Let’s have that show of hands: if this is the first time you’ve heard about Jesus, raise you hand. Or admit to being a Jesus-virgin in the comments. Please – we know about Jesus! And, what’s more, most of us would be happy if we didn’t. While some feel duty-bound to treat him with respect (God knows why when they don’t do the same for Father Christmas or Julius Caesar) most recognise him for the myth he is and trust their instinct not to get involved. Here in the West it’s almost impossible to escape him, especially as Christmas approaches. Church leaders, with free access to the media, burble on about him, Christian web-sites number in the hundreds of thousands, and songs about his miraculous, fabricated birth will soon be everywhere. At any time of year, armies of street preachers invade our town centres, shouting about how we all need him, while Jehovah’s Witnesses hawk their version at a front door near you. And if we’re really unlucky, a friend or colleague will feel it their duty to tell us all about him at work or school or in the pub. But, Christians, this isn’t how you’re meant to ‘make disciples of all the world’. The Jesus of the gospels (though that should be ‘Jesuses‘, plural) tells his followers how it should be done. Not by ambushing others to tell them how much they need him but by letting your lights shine (Matthew 5.16). Your ‘good deeds’ and sacrificial love are what should mark you out and impress others; Jesus says so himself. Actions, not words, are how to demonstrate your faith in him, if that’s what you feel you must do. But they don’t, and that’s why we’re not interested when you’re subjecting us to your fantasy and dogma. If you lived the life – the really radical life Jesus advocated – forsaking wealth, spending yourself on others, going the extra mile, turning the other cheek, giving and forgiving, loving everyone sacrificially – then we might just be persuaded there’s something to this Jesus cult after all (then again we might not). As it is, talking the talk without walking the walk, is – how does the Bible put it? – just the empty noise of clanging cymbals. This entry was posted in Christian failure, Christian proselytising, Christianity's failure to deliver, Conversion, God's standards, The impossibility of faith and tagged Christian love, Christians, evangelism, Gospel of Matthew, hypocrisy, impossible morality, Jesus by Neil. Bookmark the permalink. David Clarke: You make some good points Neil. Christians are often guilty of forcing their opinions on people. Naturally, professing atheists never make that mistake, for they are considerate and understanding. They would never make statements that could be offensive for they will consider the feelings of their audience. They will never drone on interminably, for they understand how best to communicate. They will never assume an intellectual superiority because although they know the truth they wouldn’t want to sneer at those too stupid to accept it etc etc. That is the case, isn’t it? 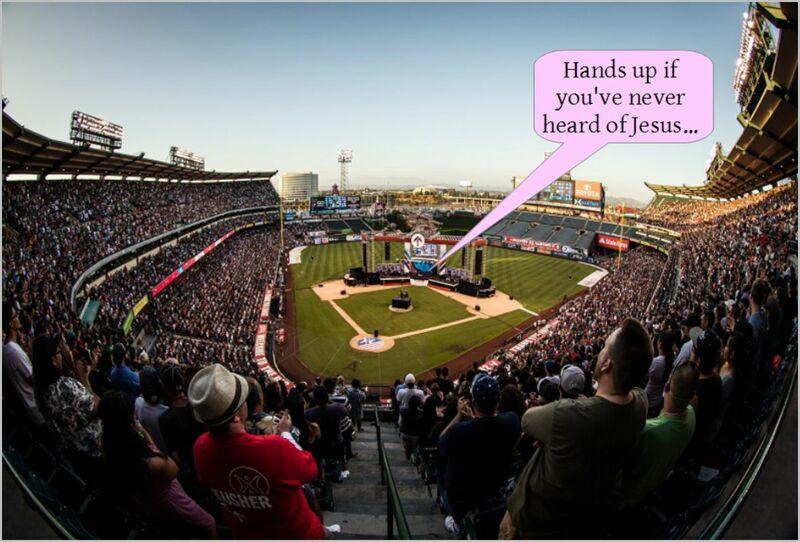 Also, why ask Americans to put their hands up of they’ve never heard of Jesus? Neil: Well, I’m glad we’re finally agreed on something, Dave! You are so right about the general superiority of atheists. They can be annoying, of course, when they start preaching in the town centre or come to your door just when you’re having your tea. And what about all those meeting places they have, on just about every corner of the city, with smart-arsed posters about Adam and Steve on the outside? And can you believe how they pop up every morning on Radio 4 to tell you what to think about for the rest of the day? They really do have too much of a platform from which to promote their views. No wonder they’re so insufferable!